In a world where “social good” is now becoming synonymous with marketing strategy, nonprofits are not only finding themselves having to compete for funds with other nonprofits, they're also forced to compete with for-profits seeking to expand their market share through social missions. It's true. People are becoming more and more comfortable executing their charitable giving by purchasing shoes, eyeglasses, or salad dressing rather than donating to nonprofit organizations. And while corporate responsibility is great, it does impact the bottom line for nonprofits – considering there's only so much charitable giving to go around. 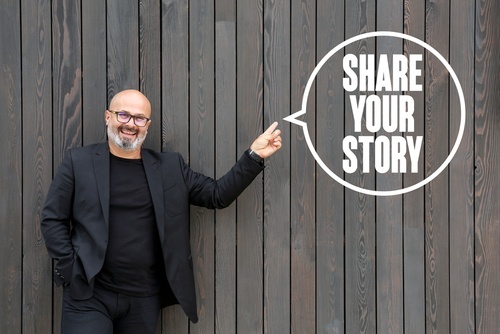 One of the most effective ways for your nonprofit to differentiate itself is by sharing powerful, mission-related stories that raise your cause awareness and demonstrate your impact. Below, we’ve created a list of 21 nonprofit storytelling tips to help you stand out and remain relevant. Before you dive into this process, start out by answering the “why” questions to establish a purpose and goals. Why are we doing this? Why is our story important? Why does this matter to our audience? Identify your audience. If you haven’t taken the time to create audience personas, plan to do so before writing your stories. Make your stories actionable. Consider what motivates your audience to take action. Craft a compelling narrative that will make your audience want to lean in and long for more. Follow a classic story pyramid: Exposition > Rising Action > Climax > Falling Action > Denouement. Remember the 5 fundamentals of great nonprofit storytelling: Character > Challenge > Connection > Call-to-Action > Change. Display humanity and compassion. Share emotional stories about real people (or animals), living in real circumstances, facing real challenges. Introduce dynamic main characters (also known as the hero or protagonist). Write your character’s story in a way that is meaningful and relatable to your audience. Describe your hero’s challenge with vivid language that paints a clear picture for your audience. Use visual content including pictures and videos to help illustrate your stories. Tie your hero’s challenge to a specific call-to-action, and explain how your audience’s support can change your hero’s circumstances. Construct your call-to-action using persuasive language and an urgent tone. Place the focus of your narrative on your cause and mission rather than on your nonprofit. Keep your stories short, simple, and significant. Always be honest and authentic. The only way to truly connect with your audience and build a meaningful relationship is through trust. Enlighten your audience regarding the stakes of not taking action. Describe how your hero can overcome his/her challenge with your audience’s support. Create a series of stories that can be shared across multiple marketing channels in a variety of content formats. Leverage your stories as an opportunity to educate your audience about your cause. Share data and impact as part of your narrative. Make inspiration your number one objective. When people are inspired to act on your behalf, achieving your fundraising goals will be the byproduct of effective storytelling. End on a positive note. Never leave your audience suspended in conflict. Conclude your story with an encouraging message that uplifts and drives immediate action.